Apple releases iOS 5.1.1 update | What Hi-Fi? 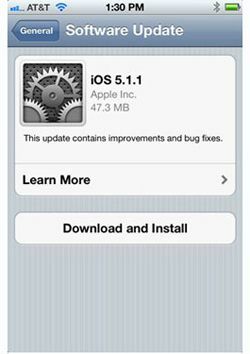 Apple has unleashed iOS 5.1.1, the latest version of its iOS operating system. But don’t expect any earth-shattering new features – this is more of a bug-squashing update than anything else. The 5.1.1 update improves the reliability of HDR photos when you’re using the lock screen shortcut, fixes bugs that were affecting AirPlay video playback, as well as those preventing you from switching between 2G and 3G networks on the new iPad. It also improves the reliability of syncing Safari bookmarks and your Reading List, and finally fixes a problem where you were given an “Unable to purchase” message after buying something. If you’re a bit disappointed by that, remember that there’s a big update coming up very soon: Apple is expected to unveil that at the WWDC (Worldwide Developers Conference) in June.